The application is open until February 17, 2017. Our present understanding of the structural aspects of gauge theories as well as their role in a foundational and axiomatic framework for quantum field theory is not as developed as our current knowledge of their phenomenological consequences. A topical example is the quest for the construction of a good class of observables in a quantum theory of gravity, in view of diffeomorphism invariance. In general, one would like to better understand in which sense the rich structure of gauge theories with its fruitful relations to mathematics, well known at the classical level, has a counterpart in the quantized theory. 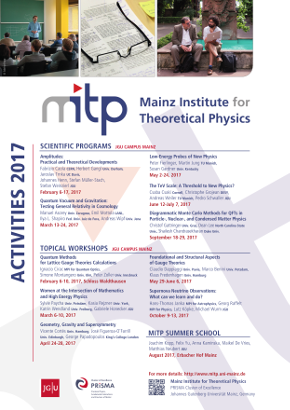 The Topical Workshop brings together different communities (like algebraic and axiomatic quantum field theorists and scientists working on the BV-BRST approach) which do not have close contacts on a regular basis, but share a common aim, namely the investigation of structural and foundational aspects of gauge theories.